All transportation leaves from the Kaufman parking lot. Please contact (email, text or call) the point person listed for each volunteering period at least 12 hours ahead of time so they know to look for you and no one gets left behind – thanks! Work at the farm varies from day to day but is almost consistently outside and physically engaging. Please wear clothing you don’t mind getting dirty plus sturdy shoes. Bring a hat for sun protection and a reusable water bottle. 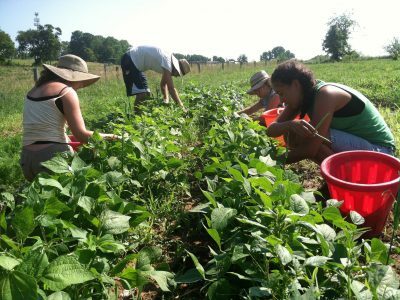 The Farm offers many opportunities for interested students and campus organizations to get their hands dirty! Volunteers get to punctuate their week with an afternoon at the farm, working alongside farm staff and breathing in the fresh air. What does a volunteering job on the farm entail? This is our favorite question to answer! …Everything. Each and every day is different. 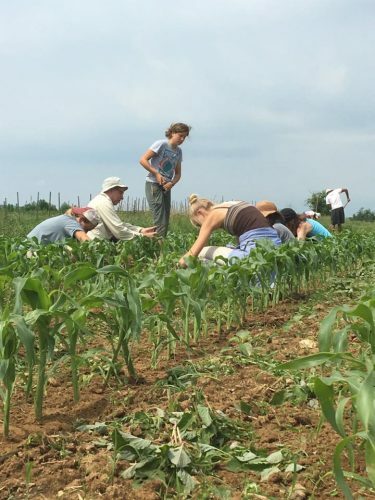 Volunteers help with seeding, transplanting, weeding, watering, harvesting, and washing crops. Student volunteers can expect to engage in work that is fun and physically engaging. Every week during the spring and fall semesters, the Farm hosts “Weed-n-Feed,” a student work day. Vans depart from the Kaufman parking lot each Friday to transport student volunteers to the farm. After helping with the work at hand, volunteers enjoy freshly made snacks and other locally-procured goodies! The farm truly appreciates volunteer help, plus Weed-n-Feed is a great way to start to learn more about the farm! Weed-n-Feed will continue every Friday throughout the semester. Vans depart from the Kaufman/DPS parking lot at 1:00pm and return at 5:00. Please join us! Students unable to make the Weed-n-Feed work days or the volunteer hours posted below can contact the Education and Outreach Coordinator at farmcoordinator@dickinson.edu to arrange alternative volunteer hours.